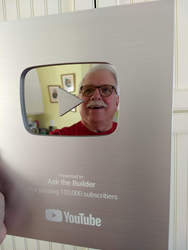 YouTube has recognized Ask the Builder video channel for its achievement of having 100,000 subscribers. The Ask the Builder channel was the first home improvement YouTube Partner and now has more than 665 how-to videos on YouTube. Tim Carter, founder of Ask the Builder. It’s really fulfilling to be able to partner with YouTube to share my hard-earned knowledge. The Ask the Builder video channel on YouTube recently surpassed 100,000 subscribers and continues to grow. It’s an enormous honor that adds to the Ask the Builder YouTube legacy. The Ask the Builder channel was the first home improvement YouTube Partner and now has more than 665 how-to videos curated on YouTube. Susan Wojcicki, YouTube CEO, stated, “You’ve just done something that very few YouTube creators accomplish - you had an astonishing 100,000 people subscribe to your channel.” In just a short amount of time after this announcement, Ask the Builder had already added yet another 2,372 subscribers! The Ask the Builder YouTube videos feature national award-winning builder and remodeler Tim Carter demonstrating how to do a wide variety of home building, remodeling, and repair projects. His 3-Way Switch video alone has been viewed 1,398,557 times and all his videos combined have 60,292,151 views. Carter’s How to Floor Grout video has helped 1,193,844 DIYrs and pros install high-strength grout in between their floor tiles. “Each and every person who has subscribed to your channel has been touched by what you created. They were inspired, challenged or entertained,” added Wojcicki. Consumers and pros watch the Ask the Builder videos. In just the past twenty-eight days the total watch time exceeded 1,050,870 minutes. In that same time period there were 446,000 additional videos views and Carter’s channel added another 1,428 subscribers. “Excellent video. Rarely do I subscribe based off one video. This one nailed it.” Dennis Cherenkov, a brand new subscriber, had that to say after watching Carter’s How to Vent Plumbing video. Comments like Cherenkov’s accumulate on a daily basis.